Sick children have the right to quality medical care that restores them to greater health. Since the mid-1990s, Unicef and the World Health Organization have promoted Integrated Management of Childhood Illness (IMCI) as the comprehensive service delivery model at primary care level to achieve this goal. The full IMCI package involves three components: improving the case management skills of healthcare staff; improving overall health systems; and improving family and community health practices. After almost three decades of the implementation of these components across different contexts, the level of effective coverage varies between countries. Based on the strategic review of IMCI undertaken by Unicef and WHO in 2016, we have analysed how the three components have been implemented. The experiences of different countries show the successes and constraints that influence IMCI implementation in different political, epidemiological, and social contexts. We identified three major determinants of effective coverage: political leadership to ensure an enabling environment; strengthened health systems based on empowered, recognised, motivated, supplied, and supervised frontline health workers; and empowered communities that can hold systems accountable and utilise IMCI services. A paradigm shift is needed to make sure that the key components of IMCI are implemented at scale. IMCI has been associated with reductions in child mortality1 and has been introduced into more than 100 countries since the 1990s (box 1).2 Early adopters recognised the need to complement innovative integrated clinical management protocols with specific health systems strengthening efforts that are related to management and supplies,34 as well as community based interventions to raise awareness around early care seeking and to improve family and community health behaviours.5 Subsequently, these three components were presented as a comprehensive package, accompanied by training tools and operational guidelines. In 1997, WHO and Unicef developed the Integrated Management of Childhood Illness (IMCI), a strategy that focuses on the right to heath and the wellbeing of the whole child. IMCI aims to reduce death, illness, and disability, and to promote improved growth and development among children under 5 years of age. IMCI includes both preventive and curative elements that are implemented by families and communities as well as by health facilities. The strategy includes three main components: improving case management skills of healthcare staff; improving overall health systems; and improving family and community health practices. This paper focuses on the operationalisation of the three components of IMCI, and suggests ways to strengthen coordination between clinical care, service delivery, and community based activities to improve scale and effective coverage. In some countries, the facility and community components have been introduced suboptimally and without coordination among implementing partners. In Peru, this resulted in the introduction of the facility and community components in separate districts with a loss of the expected synergy.12 Comparatively weak technical and financial support for the health systems strengthening component resulted in challenges for countries trying to align systems strengthening activities with the other components. Four critical factors stand out for successful IMCI programming2: strong central leadership; commitment to strengthening health systems; clear vision and focus on integration between primary and community levels of care; and strong pre-existing community networks. Assured domestic financing is equally important to show government commitment and leadership. Only 27.5% of countries reported that their government funds more than 75% of their IMCI programmes. 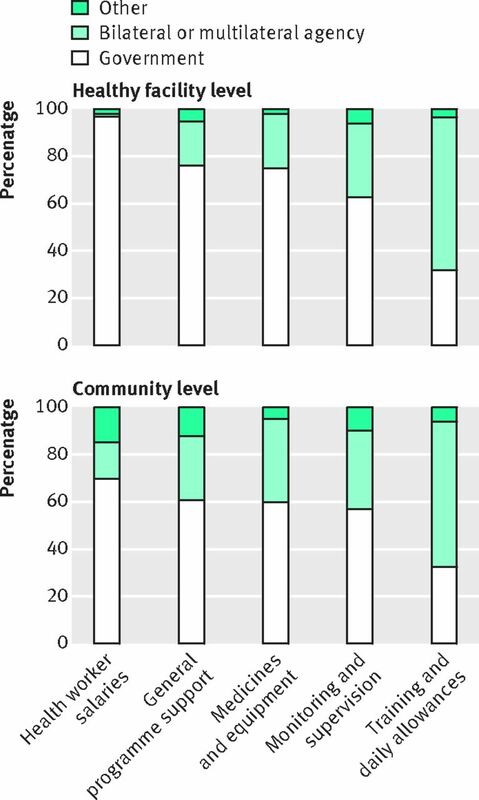 Furthermore, 85% of countries with high levels of under 5 mortality (over 80/1000 live births) reported that their government funds less than 50% of their IMCI programme.12Figure 2 presents the main sources of funding for IMCI implementation at health facility and community levels, showing that the community level especially relies heavily on donor support. While essential equipment and consumables are mandatory for effective IMCI implementation, 48.9% of all countries, and 62.1% of low income countries, identified drug procurement and supply chain management as a barrier.2 This is a problem at all levels, but at the regional level, 60% of high mortality countries report it as a barrier, compared with only 29% of low mortality countries.8 Specific challenges include drug stockouts, poor quality drugs, lack of harmonisation in estimating needed inputs, and ageing facilities. Some have questioned whether community health workers s are able to deliver quality curative care, especially considering the potential consequences of inappropriate antibiotic use for antimicrobial resistance.10 However, ample studies have shown that community health workers are able to correctly assess and prescribe, if supervised and supported by the primary healthcare system.1819 Ethiopia has developed innovative mechanisms to support the community, whereby the Ministry of Health prioritised the implementation of community based preventive, promotive, and curative care through the health extension programme. As a result, the community component of IMCI received advanced support from both government and health development partners. Subsequently, the innovative Health Development Army (HDA) was introduced, training community level volunteers to focus on local behaviour change. The HDA is a network created between five households and one model family to influence each another in practising healthy lifestyles. To date, the government has been able to mobilise over three million women in the HDA.20 Since the 1997 adoption of IMCI, Ethiopia has reduced infant mortality from 162 in 1000 live births in 1997 to 59 in 1000 in 2015. Our analysis focused on key issues around governance, health systems, and community engagement that impact on successful IMCI scale up. We did not focus on technical challenges in clinical management protocols, gender inequalities, or humanitarian contexts. WHO is currently leading a revision of the technical protocols to tackle shifting epidemiology and lessons learnt. ● Community empowerment and mechanisms supported by local and international partners as well as civil society—allowing caretakers to hold systems accountable for delivering quality IMCI—are key to ensuring demand, utilisation, and availability of services. To secure the above points, the global community needs to come together to rethink approaches and translate existing knowledge into action. Firstly, child health must become a matter of public concern, with commitment from all actors contributing to the health of the child. Thirdly, it is crucial to change the pyramidal distribution of power within health system governance.24 Currently, policy and implementation decisions are largely made by central government based on global policy and recommendations, with the expectation that these will trickle down to lower levels of the health system. Difficulties arise with this approach in the face of fragile political and administrative structures. It is time to change the perspective of the pyramid, and health policy making and implementation, by putting citizens, communities, civil society, and frontline health workers at the top—and then articulate the system and build policies to ensure that these health workers are empowered, within a decentralised health system, to deliver sustainable, affordable, acceptable, and quality services to every child, everywhere. See www.bmj.com/child-health for other articles in the series. Contributors and sources: All authors contributed intellectual content, edited the manuscript, and approved the final version for submission. In addition, the authors would like to thank the many contributors to the research underpinning the 2016 Strategic Review of IMCI. The authors alone are responsible for the views expressed in this article, which does not necessarily represent the views, decisions, or policies of the institutions with which the authors are affiliated. This article is part of a series based on findings from a global review of Integrated Management of Childhood Illness (IMCI) funded by the Bill and Melinda Gates Foundation. Open access fees were funded by the Health Systems Research Unit, South African Medical Research Council. The BMJ peer reviewed, edited, and made the decision to publish the article with no involvement from the Medical Research Council. World Health Organization. Towards a grand convergence for child survival and health: A strategic review of options for the future building on lessons learnt from IMNCI. 2016. www.who.int/maternal_child_adolescent/documents/strategic-review-child-health-imnci/en. World Health Organization. The analytic review of Integrated Management of Childhood Illness strategy. 2003. www.who.int/maternal_child_adolescent/documents/9241591730/en. World Health Organization. 2017. 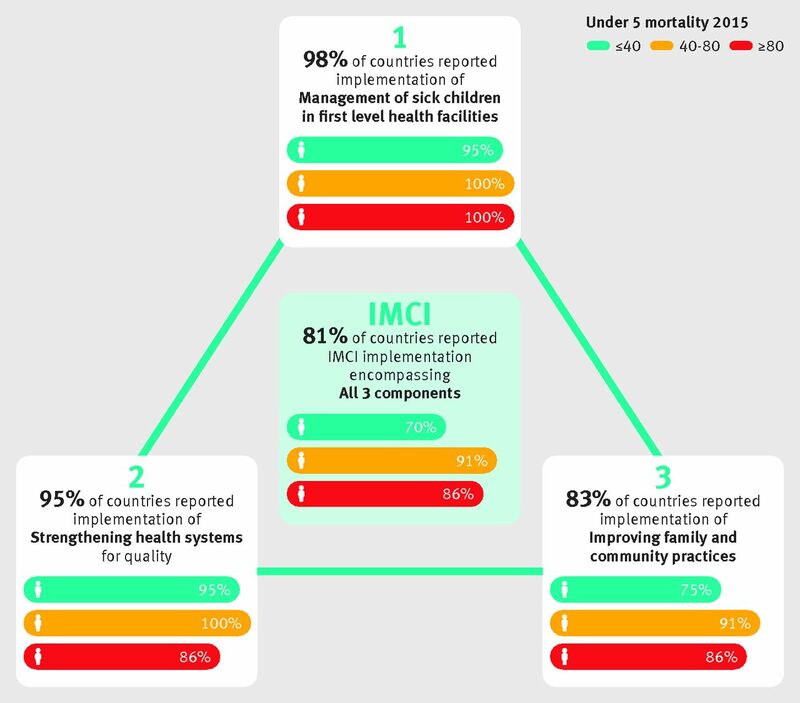 Integrated Management of Childhood Illness global survey report. www.who.int/maternal_child_adolescent/documents/imci-global-survey-report/en.
. Methods for the strategic review of programmes for integrated management of childhood illness and community cases. BMJ2018;362:k2989. Unicef. Integrated Management of Childhood Illness (IMCI) in the 21st century: a review of the scientific and programmatic evidence. 2016. www.unicef.org/health/files/UNICEF_Review_of_Evidence_Working_Paper_1_FINAL_11Oct2016.pdf. Unicef. 2016. Integrated Management of childhood illness (IMCI) in the 21st century: integration into health systems. 2016.www.unicef.org/health/files/UNICEF_-_IMCI_Integration_into_Health_Systems_Working_Paper_2_FINAL_11Oc....pdf.
. Child health guidleines in the era of the sustainable development goals. BMJ2018;362:k2993. Integrated Management of Childhood Illness: global status of implementation; WHO-Unicef, 1999. http://apps.who.int/iris/bitstream/10665/65002/2/WHO_CHS_CAH_98.1B_eng.pdf. USAID. Developing and strengthening community health worker programmes at scale. 2014 http://pdf.usaid.gov/pdf_docs/pa00jxwd.pdf. , et al. Strengthening the capabilities of families and communities to improve child health in low and middle income countries. BMJ2018;362:k2649. , et al. Future directions for reducing inequity and maximising impact of child health strategies. BMJ2018;362:k2684. Freedman LP, Waldman RJ, de Pinho H, Wirth ME, Chowdhury AMR, Rosenfield A. Who’s got the power? Transforming health systems for women and children. 2005. http://siteresources.worldbank.org/INTTSR/Resources/maternalchild-complete.pdf.